This weekend featured some boxing action from just north of Santa Fe when Holmes Promotions put on their second consecutive show inside the Buffalo Thunder Resort & Casino. It was the area’s first taste of boxing in the new year and it set the precedent for future shows impressively high for future shows in 2014. 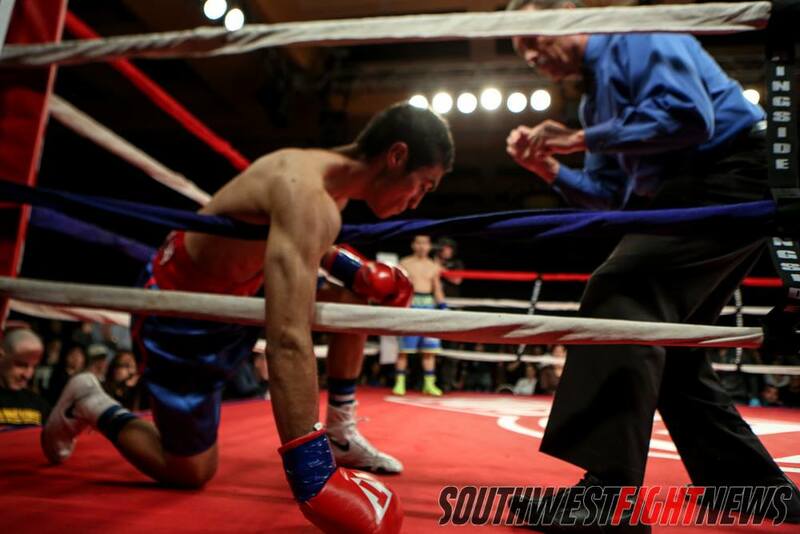 For those fight fans who aren’t aware of the staff here at Southwest Fight News, Jorge Hernandez is our resident boxing aficionado while personally, my preference has always been in the world of mixed martial arts. On Saturday night, I sat nine rows deep into the packed house inside the Tewa Ballroom in the Buffalo Thunder Casino and enjoyed the action as a spectator in a sport that I definitely need to engulf myself more around. The show featured several exciting bouts and notable moments and trading in my seat as a media member, I thought I would share some thoughts from the perspective of a fan sitting amongst all the fans who came to support their local boxers. Brandon Holmes was too much for opponent Brandon Munoz, earning two knockdowns early in round one. The Buffalo Thunder Casino is definitely a boxing area as the demographic that is attracted to the venue seem to show up in droves to support the sweet science of boxing. While MMA had solid turnouts when the King of the Cage inhabited the ballroom, boxing seems to have found a welcome home in the form of Pojoaque’s premier casino. The place was packed and I am sure the live gate for the show was impressive and deemed a success by the promoters. Pat Holmes can sell tickets and I am not sure if it is because he can promote a bout or if he just knows how to book a card. It could be both. Even in his amateur days, Brandon Holmes seemingly packed the house himself and his support crowd may be the biggest that anyone has in Northern New Mexico. Tony Valdez and Monica Lovato also had huge roars in the crowd but Brandon Holmes stands out as being an emerging local star. The set-up for the knockout Brandon Holmes left hook was a thing of beauty, it almost seemed to good to be true while watching the replays. The timing, delivery and angle were all so pinpoint; the knockout was flawless. Watching with the members of the audience in my section, many including my own opinion was that the Valdez-Gutierrez fight was closer than the scorecards suggested. I could argue that Valdez was down two rounds to one heading into the fourth and although I will never claim to be a boxing expert, I had the fight scored a draw, three rounds a piece to each boxer but thought that four rounds to two for Valdez was also a very fair scorecard. Valdez showed the “Warrior” moniker to be very accurate in the bout; despite the constant taunting from Gutierrez, Valdez was not baited into reckless exchanges. I belief his flurries definitely won him the bout as he came out advantageous in the significant exchanges in most of the six rounds. Josh Montoya was a victim of his own counter striking abilities and while I do believe that Miguel Gloria deserved the decision, I also think the win wasn’t clearly decisive. No argument that Gloria threw more punches but most of those either caught air, hit the gloves of Montoya or deflected away from the body or face area. Montoya would have stolen rounds very easily if he had picked up his offense but nonetheless, Gloria’s pace and volume earned him the nod. Angelo Leo. Maybe the most impressive performance of the night, Leo blasted an uppercut down the pipe and ended the fight quickly and emphatically. At 19-years old, I definitely put him into my category of “must see” going forward. Monica Lovato was the “feel-good” winner of the night. She dedicated the fight to her mom who had passed recently and she overcame legitimate adversity to get her first win in several years inside the boxing ring. The audience was loud in support and while she arguably lost the first two rounds, the crowd roared for her as she mounted her comeback. From nine rows back, the thunderous power in her strikes was impressive. Hometown favorite Monica Lovato started slow but her power punches overwhelmed her opponent late in rounds three and four. The building up of Nohime Dennison and Lovato needed more….. information. I don’t know that the crowd was fully aware of who Dennison was and while the squaring off inside the ring had some heat, I believe that if the in-ring announcer had built Dennison up to the crowd more that it would have received much more anticipation. I heard a lot of people question who Dennison was and if she was even in the same weight class as Lovato as Dennison stands as a very imposing female athlete. The opening bout of the night was a confusing one in all facets of the word. The crowd was unsure of how to score the fight as many in my area had no idea who was winning which indicates a great fight and solid match-making. Michael Coca Gallegos and Matt Baca fought valiantly for six rounds, even though many thought it was over at four. I agree with the decision but in the same way that I do concerning the main event. If the fight had been scored for Coca-Gallegos I wouldn’t have called it a robbery but I truly thought it was a draw. Regardless, both boxers had their moments and the crowd was hyped up which is what the first fight of the night is supposed to do. It definitely set the mood for a night of excitement. The card was great and the crowd was awesome, they were full of emotion and attentive throughout. There was rarely any dead spots where the crowd grew tired. The fact that there wasn’t long intermissions had a lot to do with that as fans enjoyed very little interruption between quality fights.